The younger son of the first Marquis of Douglas and Lady Mary Gordon, William was created Earl of Selkirk in 1646. He married Anne, Duchess of Hamilton in her own right, in 1656 and at the restoration in 1660 he was created Duke of Hamilton for life. He first devoted his time to rescuing the Hamilton Estates from debt, then entered politics, consistently opposing the Duke of Lauderdale. K.G. in 1682, he became a Privy Councillor and one of the Lords of the Treasury in 1685. 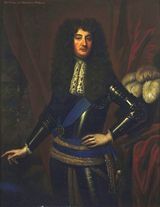 In 1688 he was President of the Assembly in Edinburgh which invited Prince William of Orange to call a Convention which in turn under the Duke's presidency, offered Prince William and Princess Mary the throne of Scotland. He died in 1694.